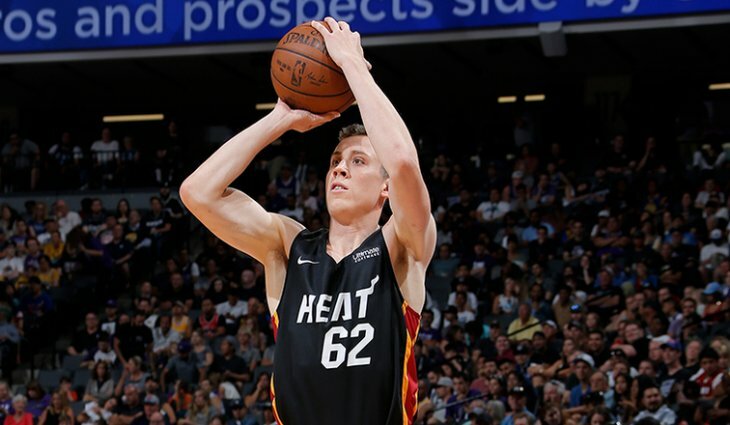 Duncan Robinson signed a two-year standard contract with the Miami Heat on Tuesday. Photo courtesy of the NBA. Down one point with less than a minute remaining, amidst the buzz of a rowdy Hampden-Sydney crowd on Jan. 2, 2014, first-year Duncan Robinson set a ball screen for Hayden Rooke-Ley ’15, popped off for the pass and drained the go-ahead 3-pointer from the top of the key that would eventually secure a 70-68 victory for the Ephs. The Portsmouth, N.H., native looked nonchalant after hitting the game-winner in a seemingly ordinary, well-executed play. Today, Robinson drains the same shots from deep, but he now does so in the American Airlines Arena in front of 20,000 fans. On a two-way contract with the Miami Heat, Robinson played 13 games in the NBA (starting in one of them) and spent the rest of the 2018–19 season with the Sioux Falls Skyforce, Miami’s G League affiliate. On Tuesday, the Heat converted his deal into a standard NBA contract through the 2020-21 season. When Robinson first strolled onto the court to meet his new Eph teammates in the fall of 2013, Wohl recalled it wasn’t his 6’7” frame or his look of calm intensity that stuck out, but rather what was on his feet – retro Jordan 11 sneakers. Wohl’s first impressions were spot-on. Robinson proved to be much more than a sneakerhead during his first year at the College, going on to not only drain the game-winning shot against Hampden-Sydney, but also earning NESCAC Rookie of the Year and All-America honors in the 2013–14 season that ended in a NCAA national championship game defeat. Following the Ephs’ loss to the University of Wisconsin—Whitewater on a last-second layup in the tournament final, the men would suffer an even greater blow when Maker announced his decision to leave for a Div. I coaching job at Marist. Just as Maker was accepting his promotion, Robinson was offered his own chance at Div. I competition with an offer from Michigan. Maker and Robinson would both have a hard time leaving Williamstown, a place where special memories were made. 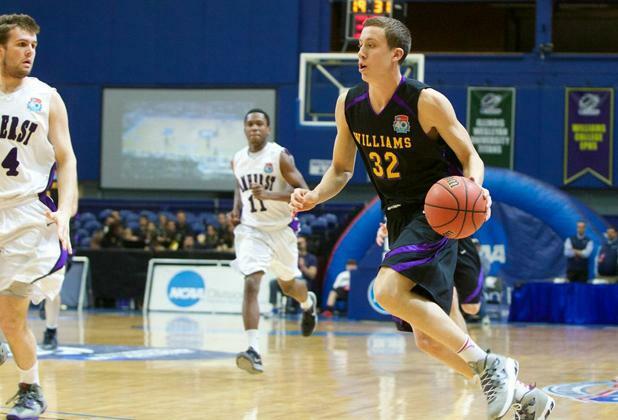 Duncan Robinson earned All-America honors and started for the Ephs in 2014. Photo courtesy of Sports Information. In the fall of 2014, Robinson would transfer to play Div. I basketball at Michigan, where he became the 53rd player in history to score 1000 points as a Wolverine. With his Williams teammates watching in the Alamodome, the forward helped lead Michigan to the NCAA national championship game against Villanova during his senior year and was subsequently named 2018 Big Ten Sixth Man of the Year. When summer came around, Robinson had to make another pivotal decision, either accepting a spot on the FIBA Basketball World Cup team or joining a team in the NBA Summer League. A call from two-time NBA champion and Miami Heat head coach Erik Spoelstra cemented his decision to realize a lifelong dream. After training with the team and brushing shoulders with future hall-of-famer Dwyane Wade and 16-year Heat veteran Udonis Haslem, Robinson made his official NBA debut on Oct. 24 against the New York Knicks. Within 20 seconds of checking into the game, he knocked down a transition 3-pointer from the top of the key for his first career NBA points. Despite his meteoric rise from a Div. III athlete to an NBA player, Robinson still remains close with the people who saw him putting up shots in Chandler Gym late into the night.